Your business or organization is not like any other and your website should reflect the uniqueness of your business. When you choose Brown Design Company, we custom design your website, creatively, purposefully, specifically to represent your business. We are professional web designers who take the time to listen to what you really want and need. Whether you start large or small, we will work with you as your business grows. We are here for you and we want you to succeed. We have posted screenshots of some of our recent website designs below. Click on the photo for the link to visit each website. Comprehensive Service means we can take care of it all for you! We design each website with Responsive Design so that it will adjust to the screen on which it is being viewed. 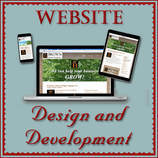 Your website will look just as great on your iPhone, Android, iPad, Tablet or PC.